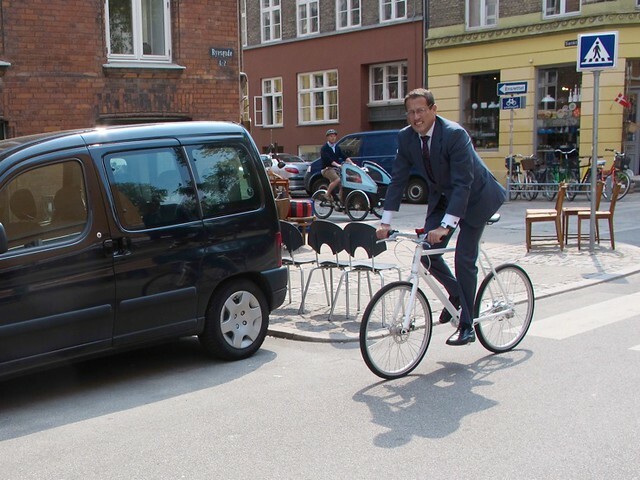 CNN's Richard Quest is in Copenhagen with a film crew shooting an installment of Future Cities. Copenhagen is, of course, a future city. Quest looks dapper as always. Richard looks as though he could really use a nicely-sprung Brooks B67 saddle. I mean, I've sat where he's sitting and if you're not used to it, well, it can be quite uncomfortable. I agree. Look at that grimace. He looks like he has haemorrhoids. The woman in the background on a tricycle is one of his crew? That helmet looks definitely un-Copenhagenesque. I think he did nicely, he was mid speak (camera man out of the frame) when he was caught off guard, and asked to smile no less. Thank you CNN for not buying into the plastic hat tyranny, and giving us the cuffed rider. i think he is squinting in the bright sun. he looks pretty comfortable as most new cyclists set the saddle pretty low and his looks like it's at the right height.